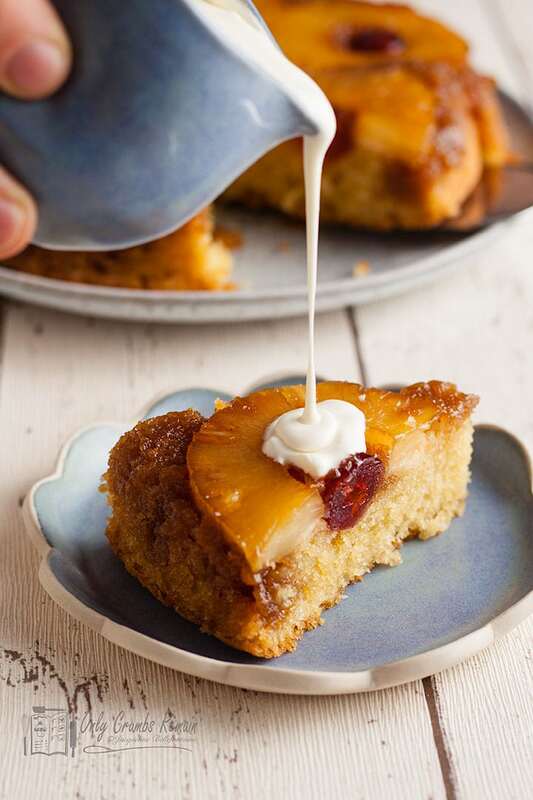 This easy Pineapple Upside Down Cake recipe makes a delicious dessert served warm with cream or custard. Or serve a slice cold with morning coffee or afternoon tea. Either way this classic dessert cake is doddle to make and a fabulous treat. My predecessor on Only Crumbs Remain, Angela, loved to make an upside down cakes and posted several variations here on the site, including her Blood Orange and Chocolate Upside Down Cake, Bilberry Upside Down Cake, Rhubarb and Ginger Cake and Blackberry and Almond Cake. All of them are really totally delicious I know, I’ve tried them (well except Bilberry, I used blueberries instead) but sometimes its hard to beat a good old classic. 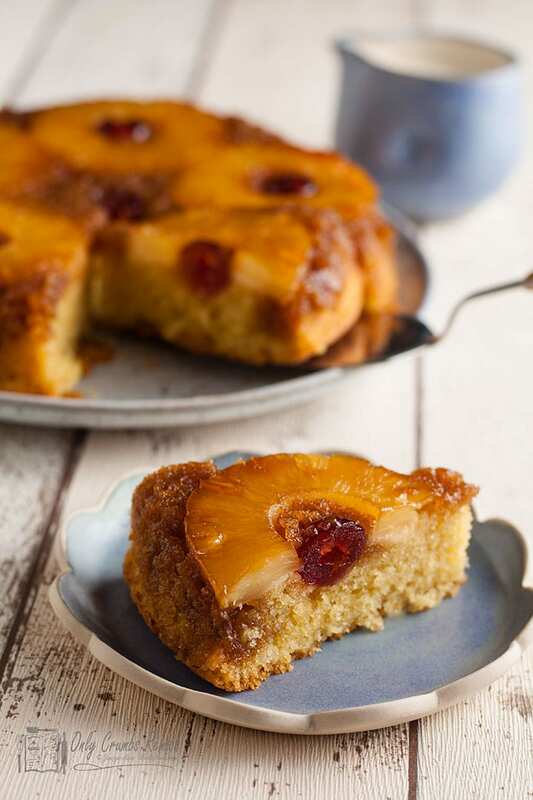 Pineapple Upside Down Cake has been a family favourite of ours for years. My youngest son, Will, designed the new logo for Only Crumbs Remains and I said I would pay him in cake when he was home from Uni and this is what he asked for. So how could I refuse. Upside Down Cake or Dessert? It is a dessert than can be made in minutes and once baked can almost disappear in as many minutes. Its a great standby for Sunday dessert, when I haven’t thought of anything else to do as I usually have all the ingredients I need to hand. Although I confess I don’t usually add the cherries as the boys don’t like them but I wanted this to be a true classic recipe. We like it best still warm from the oven with cream or custard as a dessert. Some recipes for this cake are called upside down pudding! Then again it is also good cold, so any left over is enjoyed as cake with a cuppa the next day. I would love to know which way you prefer to eat it. Melt the butter and muscovado sugar together until combined and pour into the base of the prepared tin. Arrange the pineapple and cherries in the tin. Beat in the eggs one at a time adding 1 tbsp flour with the 2nd egg. Fold in the remaining four until just combined. Spoon on top of the fruit. Carefully spread level taking care not to dislodge the fruit. An easy to make classic upside down cake which is also perfect served warm as a dessert. Preheat the oven to 180℃ (150℃ fan)/350°F/gas mark 4. Lightly grease a 18cm (7in) shallow round cake tin. Melt 50g (2oz) butter and 75g(3oz) muscovado or caster sugar (see notes) in a pan stirring until combined. Pour into the base of the tin. 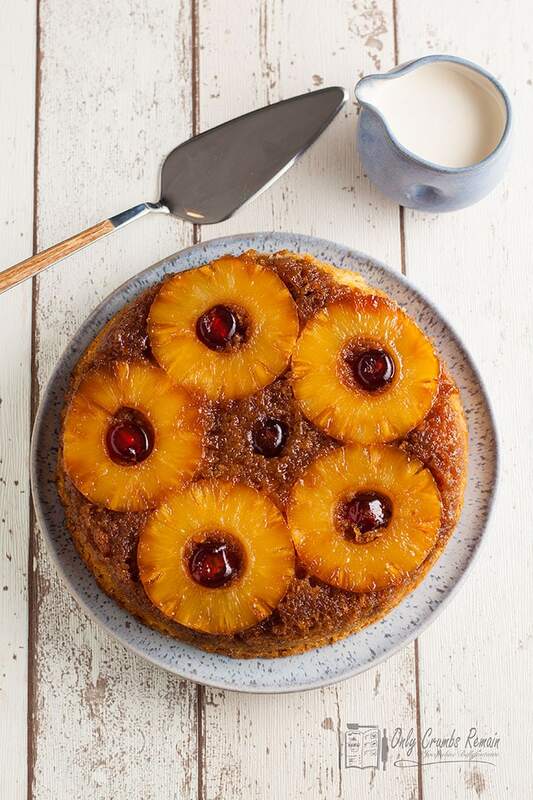 Arrange the pineapple rings and cherries in the base of the pan. Beat the butter and sugar together until very light and fluffy. Then beat in the eggs one at a time, beating well after each addition. Add a tbsp of flour with the second egg. Beat in the vanilla extract, then fold in the remaining flour. 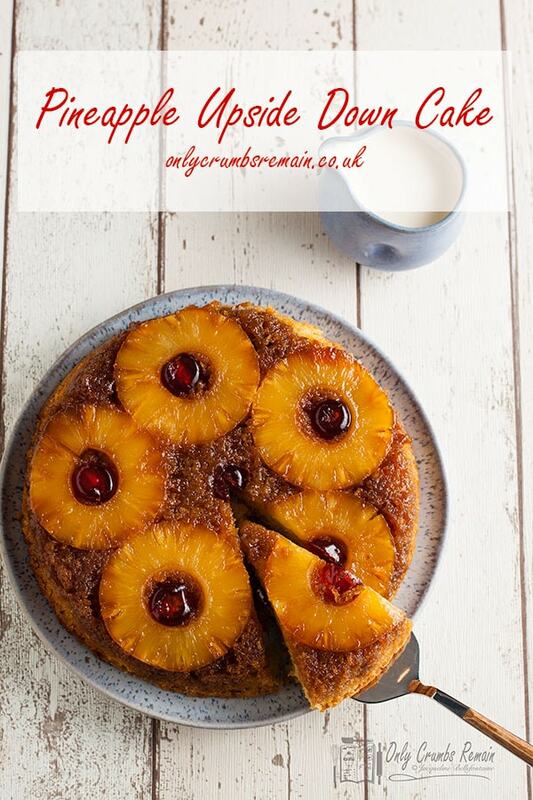 Spoon into the cake tin and carefully spread level over the pineapple. Bake in the centre of the oven for 35 minutes or until the cake is springy to the the touch. Allow to cool in the tin for 5 minutes then carefully flip out onto a serving plate. Serve straight away or allow to cool before serving. Using muscovado sugar for the pineapple layer will giver a richer caramel flavour to the topping. For a lighter caramel use golden caster sugar. Alternatively you can pour a little golden syrup straight into the tin before adding the pineapple. Adding a tablespoon of flour with the second egg will help prevent the cake from curdling. The cake is cooked when pressing gently into the centre the cake springs back and does not leave a indentation. Do not use a loose bottomed tin to make this cake or the caramel will leek out. The cake will keep in an airtight container in a cool place for up to 3 days. Freeze for up to 1 month. Beautiful cake! Looks super moist, I bet it’s hard to eat a single slice….